Sumo wrestlers are popular figures in Japan. In fact, they are regarded as celebrities owing to their weight. They are unique, being larger than the regular Japanese citizen, and they take part in the country’s national sport. 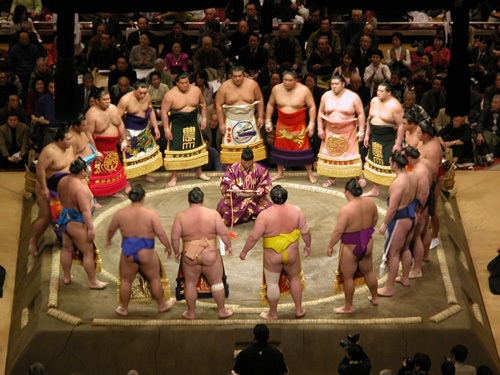 Sumo is a Japanese style of wrestling that dates back to the ancient times. Its purpose then was to entertain the Shinto deities and by tradition, only men are allowed to be involved in this professional sport. Unknown to many, sumo wrestlers live in a stable while they are young and there are currently 54 stables in existence. The place is run by a stable master or oyakata which means boss, usually a retired wrestler who was a good one in his prime. Along with the master, other people live in the stable such as his wife called okamisan, referees, ushers and hairdressers. While living in these stables, the wrestlers do daily workouts to improve their strength. Their day starts early in the morning at around 5 a.m. with the unranked wrestlers training first. Each stable has a ring where these sumos practice. Sumo wrestlers do various exercises each day. These include the shiko or the ritual stamping of their legs to improve their lower body strength and the teppo which teaches the basics of moving their feet and hands as they topple an opponent. There’s also the matawari which aims to develop the lower body’s flexibility. By 8 a.m., the young wrestlers prepare their food or chanko in the kitchen. Chanko or chankonabe includes stews, Chinese food, sashimi and other deep-fried food. Other recent inclusion in their diet particuarly for the young ones are rice with curry and hamburger steaks. When serving, chankonabe is sometime precooked. However, the usual way of serving it is on a hot plate with the ingredients to be cooked the shabu shabu style. The rules of thumb in making this special meal are it has to contain lots of protein whether chicken, tofu, beef or fish and vegetables. Take note that sumo wrestlers need to grow big and as such they are required to eat beyond their usual appetite. And they follow certain rules to achieve this. To store fat in their bodies, these men exercise on an empty stomach and sleep after eating. Also, it’s the junior wrestlers who normally do the chores for the elders. Interestingly, there are sumo restaurants available in the capital city of Japan. They can be found around Tokyo’s Ryogoku area which is known as the Mecca of sumo wrestling and are owned by former sumo wrestlers themselves. Retired wrestlers often set up restaurants that specialize in chankonabe which they had learned to make during their stay at the stables.